When first stepping through the door, the University of Michigan’s Walter E. Wilson Student Team Project Center feels familiar, like a well-equipped hackerspace/makerspace. A Haas vertical mill dominates the main floor, more modern than i3’s but otherwise similar. In the back are manual mills and lathes, and a nontraditional vehicle (in this case, a solar car) hangs from the ceiling. 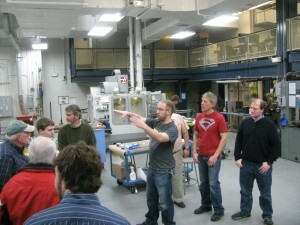 Upstairs, an electronics lab is giving rise to the next generation of self-contained autonomous quadrotor helicopters. There’s a feeling of easy camaraderie and a subtle sense that the future is taking shape within these walls. What’s different about the Wilson STPC is that there’s no hobby activity here — no couch, no gaming, no rogue bumper stickers, no tinkering for the sake of tinkering. Use of the Center is for students only, of course, but beyond that, it’s restricted to official student teams competing in various events. Among them is the Michigan Autonomous Aerial Vehicles team, competing in the International Aerial Robotics Competition. Dissatisfied with the suitability of commercially available UAV platforms, MAAV is building their own, and they were kind enough to give i3 Detroit a behind-the-scenes tour on Sunday. Unlike the internet-darling quadrotors performing aerobatics in a sensor-studded room, MAAV’s machines are almost entirely self-contained, designed to operate in an uncontrolled environment. So in addition to the obvious motors and rotors and batteries, they’re flying sensor platforms, with two onboard LIDAR units, accelerometers, gyroscopes, cameras, and several processors to handle the numerous tasks required. That’s all fixed to an astonishingly strong carbon-fiber frame, home-brewed using a novel molding technique. i3 Detroit’s tour group got to meet several MAAV team members, check out various early and current hardware versions, and ask tons of questions. As several of our members have robotics and quadrotor experience, there was idea-sharing in both directions. To demonstrate the stability of the quadrotor’s control system, our guide Jonathan told it to take off and hover at a particular position, and then grabbed one corner of the machine and pulled it several feet out-of-place. It returned immediately to its commanded position and held there, steady as a hummingbird, until commanded to go somewhere else. See the full video of the demonstration here. After leaving the STPC, half of our group continued on to the day’s second destination, a datacenter by the name of MACC: the Michigan Academic Computing Center. Housing servers and equipment for numerous university departments, it’s a rack-mounted forest of Infiniband cables, storage arrays, and machines with names like “dixiedynamite”. We compared notes about power and cooling, talked about fiber optics and interconnect latency, and hunted down a lone GPS time server. There are plenty of interesting places in southeast Michigan, and with these field trips, we’re exploring some of them. Stay tuned! Car hacking: Friday, 7pm. You’re invited. Q: What has four wheels and fifteen computers? For years, I’ve described hackers as “greasemonkeys with cleaner fingernails”. The eagerness to dive into a complex system, the urge to squeeze more performance out of one’s daily-driver, the itch to tinker with something that already “works just fine”. Sound familiar? As the computer industry and the auto industry continue to overlap, we find ourselves in an interesting spot: Cars are increasingly “street-legal cellphones”, with more and more of their functionality controlled by software, connected through data networks, and accessible to anyone with the right tools and know-how. 1. To connect interested individuals, both within and outside i3’s membership. 2. To familiarize everyone with the tools available and projects afoot, including (tentatively) a demonstration of the OpenXC Platform. This is the first in a recurring series of car-hacking meetups, which happen monthly on the fourth Friday at i3 Detroit. Come play. https://www.i3detroit.org/wp-content/uploads/2014/03/Logo_large_png8-300x98.png 0 0 Nate Bezanson https://www.i3detroit.org/wp-content/uploads/2014/03/Logo_large_png8-300x98.png Nate Bezanson2013-02-21 17:21:542013-02-21 17:21:54Car hacking: Friday, 7pm. You're invited. I got my isostick today! This is a cool project that I saw on Kickstarter and contributed to back in July. After months of development (and waiting! ), the early-adopter beta-test units went in the mail Thursday, and because Elegant Invention is based in Indiana, shipping to Michigan was nice and quick. It’s now here at i3 Detroit, for anyone to tinker with (and file bug reports — it’s a beta unit, after all!). So what’s an isostick? It’s a USB flash drive with a mind of its own. Or, it’s a USB CD drive without the CD part. Basically, it’s a mass-storage device that you drop an iso9660-image file onto. The stick then pretends to be a USB optical drive, and serves up the contents of that image as if a real CD had been burned and placed in the drive. The idea isn’t a new one — the CNS iodd, later refreshed as the Zalman VE-200, does this with a laptop hard drive as the storage medium. Both of those products had a cool OLED or LCD screen on the unit, to select the active ISO. (The isostick uses a different method.) But it takes a lot of current to spin up a drive, and some USB ports were unhappy with that. CNS once mentioned a flash-based version, but it never came to fruition. And regardless of the hardware, firmware bugs took a long time to get fixed. 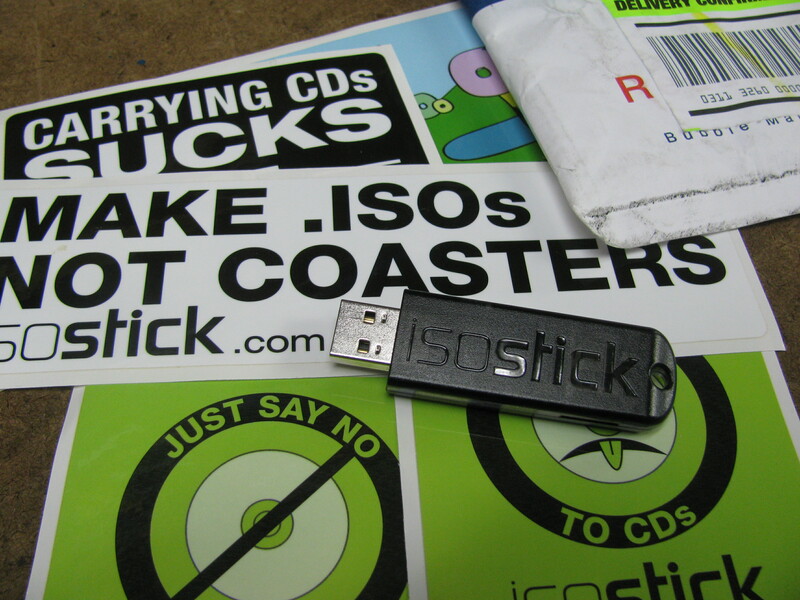 Since isostick is a kickstarter project, contacting the developer is easy — I’m on IRC with him right now. The beta-test period is a deliberate “shakedown cruise” before the product actually goes to market. And since the project was mostly funded by other techies, you can bet there’ll be plenty of edge-cases tested and fixed! Oh, and even cooler? The actual storage inside the isostick is a MicroSD card, so as flash prices continue to fall, the number of isos that can be stored on the unit only increases. 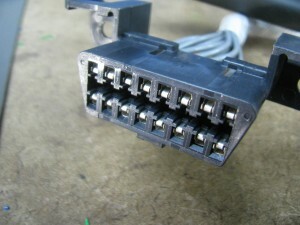 Top: Male OBD-II connectors and pins. Middle: STN1110 multiprotocol vehicle interface IC. 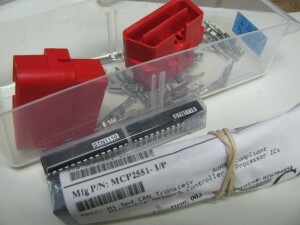 Bottom: MCP2551 CAN transceiver IC. None of this stuff is particularly expensive or hard to find, but in i3’s electronics lab, it’s already been picked out, ordered, shipped, and sorted. With this potential within arm’s reach, what will you build?